Low water bridge … under water! Flooding caused a few route changes this year. I was prepared for the flooding, though, as I practiced fording a river on my Thursday ride back in Alabama. I found all the dirt roads and gravel roads I could find that I felt were good simulation for the Rouge Roubaix course. Also, there is a stretch of the Cahaba River I’ve always wanted to try to cross in the middle of the ride. See pic below. This was my 7th roubaix having raced it every year now since 2010. This was the first time that flooding caused a major reroute. Every year it was always questionable whether we would need to bypass part of the first gravel section, but there has always been three (or four … 2013!!!) gravel sections and the low water bridge near the end of the race. 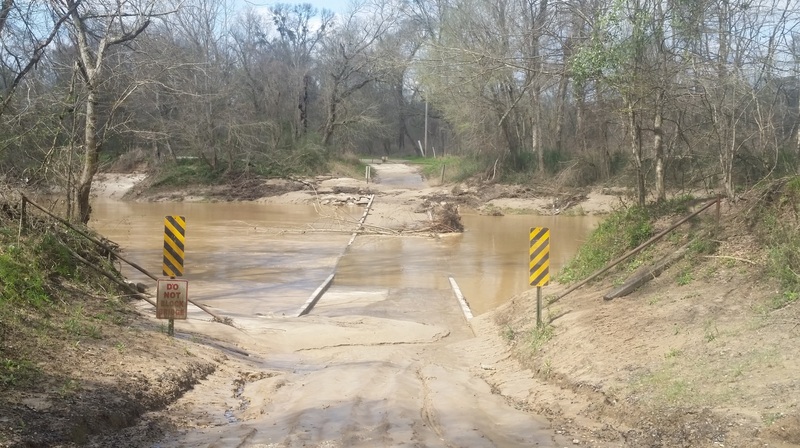 But this year, the first and third gravel sections were unrideable, and the low water bridge was impassable. The second gravel section, including the Blockhouse Hill, was rideable and quite fast with the sandy bottom after the climb packed down from the rain. Did that lessen the “epicness” of the race? Not one bit! As I write this blog, I am pulling together data from previous years. I believe this will shake out as more difficult than most years. It’s a little hard to make a fair comparison personally because I raced this year’s race a few pounds heavier than previous years and also with close to 400 miles in my legs for the week even before the start of the race and over 500 by the end of the race. We staged at a new park this year closer to the finish and downtown St Francisville. Rolling out from there, we eventually hit US-61 north and took it all the way to the left on LA-66 (the road to Angola). This marked the end of the neutral section, and as always our pace skyrocketed to 40+mph (42.1mph this year). With many strong teams in the race, nothing emerged with the right composition and the race saw a continuous stream of attacks that saw us averaging 29.4 mph from the turn onto LA-66 to the right turn onto Sligo. The twists and turns and hills and hit-or-miss pavement of Sligo usually sees a small break emerge with the field maintaining a fast but easily manageable pace that leaves you cringing that the break is “getting away”. This year was quite different as our pace was insane through Sligo without anyone trying to conserve energy for the first gravel section. We averaged 27.3 mph for the entire 12 mile stretch of roads taking us back to LA-66. I really struggled through here because I found myself near the back, and there was quite the slinky effect — basically felt like tail-gunning a criterium which can be much more difficult than riding the front! There was a lull in the pace after we made it back to LA-66, and I worked my way up to the very front and even put in one attack shortly after what is normally the turn onto the first gravel. This move didn’t work, but I was well-positioned at the front to see the real break emerge on the rolling hills before the feedzone. After the feedzone, I was also in a good position to see a chase group emerge. I was in good position to go with it as I saw Frank Travieso about to attack, but we were near the top of a hill and my legs were dying so I hesitated and just watched him go instead. At this point, the break quickly got a minute and a half on the field. I also lost a full bottle of gatorade that popped out when I hit a pothole at full speed (no flat though, +1 for Martindale 25mm rims and brand new tires). Thankfully, the field was still flying as this meant I had to last the entire first 68 miles of the race on a single small bottle of gatorade. We averaged 27.4 mph from the end of the neutral section all the way to the bottom of the blockhouse meaning the first 68 miles took well under 2.5 hours. Our pace was so fast in the field that we had started to catch the break again and could see them make the turn onto the rough road at the bottom of Blockhouse. I attacked shortly before the turn and was near the front going into the turn. I was on the left, so I rode through the puddle lake hoping that it was smooth underneath (which it was). Fearing a flat, I tried to leave enough room to see ahead but people just kept passing me until the start of the climb. I passed a bunch of people on the climb and eventually caught back up to the front of the field. By this point there were only a few of us left. As we established a rotation, several other people from the field caught up to us. As we continued pushing the pace, we eventually caught a few people who had come off the lead group. All told, there were about 15 of us in the group which was too big for any cohesive effort. I was hoping that there would be a bunch of attacks that would eventually lead to the establishment of a new smaller chase group so I hopped onto John Stowe’s wheel when he attacked a couple times. Unfortunately, there were enough people who wanted to see the group work that there was always somebody chasing to bring it back. As we approached the end, I could tell that my legs were just completely spent. I could keep up with the group, but I didn’t have anything left for the sprint. So in a vain attempt to sneak away, I attacked a bunch of times. The first attack was probably the best as I quickly got a good gap on the field but when we passed the 10K to go sign, I was disheartened and eased up knowing that I couldn’t hold that pace for the next 6 miles. The group caught back up, and I expected a counter-attack. But when the counter-attack didn’t come, I attacked again. This time my legs were pretty much done and I didn’t get very far. Finally, going into the setup for the sprint on US-61N, there was a lull in the pace and I launched one final attack. Nothing was getting away, but Joey Bacala and Jacob White countered that one and got away cleanly. I was done attacking/chasing and spent the rest of the race just holding on. I figured I would pass a few people on the final hill from people who cramped, but as it turns out there was only a couple people who sat up so I finished third from the end of our group, which was sprinting for 16th place. Joey and Jacob held on just barely ahead of the sprint to take 16th and 17th. I ended up 27th. All-in-all, it was another great race and a fun day on the bike. I would like to redo the race and make a couple different decisions, but that is what next year is for!!! Up ahead, Mike Olheiser and Andrew Dalheim were battling the Hincapie team who managed to get all 5 of their riders into the break. The Hincapie guys are not just super strong, though, they are also very smart and worked it to perfection to take a podium sweep this year with Travis McCabe taking the win followed by two riders I’ve not met before – Andzs Flaksis (Latvia) and Mac Brennan from Greenville. Andrew and Mike took 4th and 5th followed by Oscar Clark in 6th. One of the things I wanted to investigate this year was how much time was spent in my 53×11. Given how fast the first 2.5 hours of the race were, I thought it would be at least 30 minutes in the 53×11. It didn’t turn out to be that much, but I spent over 50% of the race in just four gears – 53×11, 53×12, 53×13, and 53×14 – and over 75% of the race total time if you tack on the 53×16 and 53×18. Click the pie chart below to see interactive data. Interesting w’bal data in Golden Cheetah. When my legs felt the most dead, which is what prompted me to attack, my w’bal indicates I should have been feeling fine! Click to enlarge and see detail. 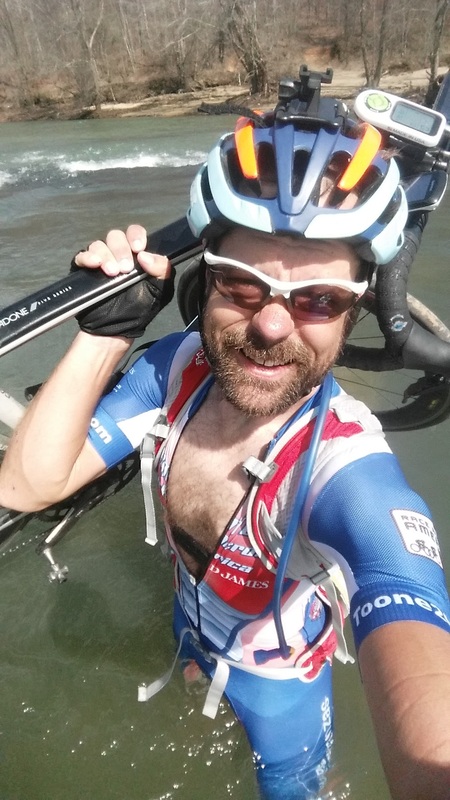 One final note – I was hoping the flooding would bring out the alligators earlier in the year than normal which might lead to my dream for this race – rounding the corner in the lead with the choice of whether or not to bunny hop an alligator in the middle of the road or even on the low-water bridge. What would you do in that situation??? 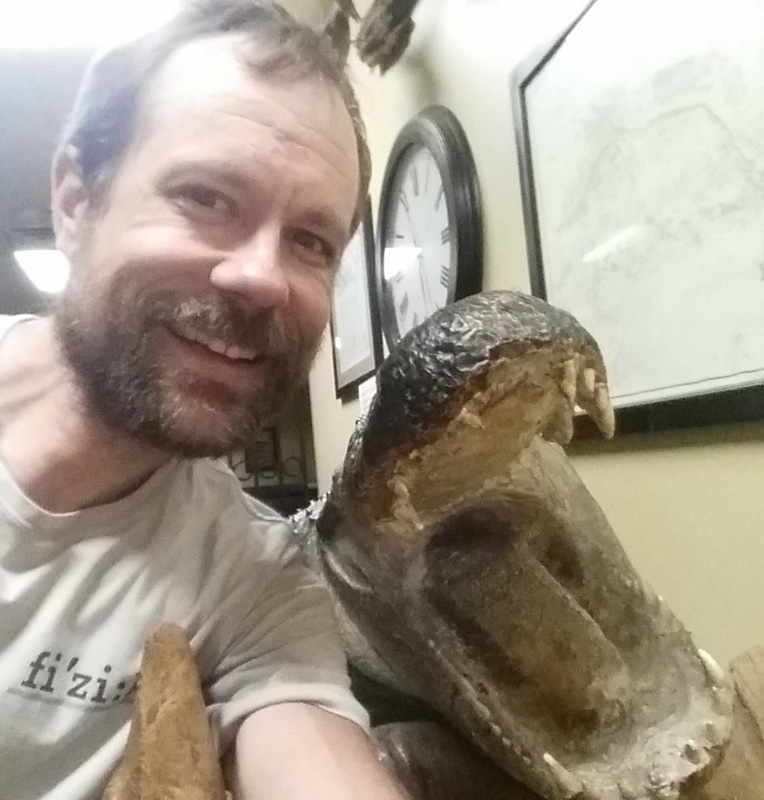 In any case, I had promised Kristine a selfie with an alligator, but the closest I could get was a taxidermied one in a gas station on our way down to the race. This entry was posted in Racing and tagged bayou, epic, flood on March 16, 2016 by kartoone.